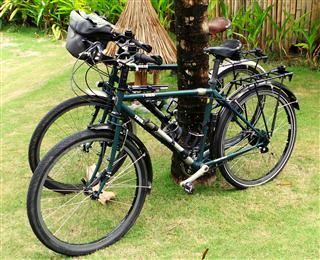 While cycling in the Philippines we met Kjell and Andrea and having swapped email addresses thought nothing more of it. Several months later we received an email from them asking if we would like to join them on a tour to mystical Myanmar. Life is too short to pass up such opportunities and before we knew it the planning was under way. It would be the first time that we had ever toured with another couple so it was a new experience for us. Myanmar really is still a wonderful place to visit, although a little more difficult for cycle touring. Following a day off in the lovely coastal town of Yeonghae we continued our journey through South Korea. This time heading south west to the far corner of the peninsular to visit the picturesque Wando Island. before heading east again along the coast to Yeosu and completing the final section to Busan by bus ready for next adventure in Japan. We arrived at Seoul's Incheon International Airport on Tuesday 8th October 2013 for the start of a three week bicycle tour of South Korea. Our arrival from Manila the capital of the Philippines was three hours late having left in a torrential rain storm. So it was that we didn-t arrive at our hotel in Seoul until gone midnight. Our ride would take us from Seoul heading north east along the Han and Bukhan rivers to reach Chuncheon just a few miles from the North / South border. From their we passed through beautiful river valleys, deep gorges and some extreme weather before arriving on the east coast of the Korean peninsular at the little town of Yeonghae. The full ride description has now been moved to our web site you can read it by clicking the following link. We had cycled the whole of Taiwan's east coast from north to south and now it was time to head north again. The west coast is more densely populated and is home to the majority of the population. So rather than work our way through this largely industrial and agricultural coast, we opted to head for the mountains and take in Taiwan's highest peak Huahuan mountain. It would prove to be a beautiful and challenging ride crossing completely across the country from west to east before heading north again to finish in Taipei. Having had three weeks of relaxation and bike preparation at our apartment in the Philippines, it was time to get back on the road. While we had been visiting friends and family in the UK, our bikes were resprayed by 'Timmy' at his workshop in Dumaguete. He did a great job,sourcing a green mat paint which was identical to the original finish. The ' Thorn' branding writing was reproduced in adhesive transfers and, as we would find out later, they would not be up to the job. So resprayed, re-fitted and lubricated, with us clad in new cycling kit, it was time to get going. The big question was, where? The first thought was north Thailand, Laos and north Vietnam. But June is the beginning of the rainy season and we hate getting muddy. Then we thought about Indonesia but it is high season there, and difficult to extend the 30 day visa. Taiwan had never really featured on our 'to do' list until we met a group of Taiwanese living on a campsite in Tasmania. They were very enthusiastic about their beautiful homeland and encouraged us to visit. We also fancied seeing Korea and Japan so a plan began to form. Flights to Taiwan with Cebu Pacific from Manila to Taipei were the cheapest, and it was cheaper to return to Manila and fly on to Korea than fly there direct from Taipei. From Busan in Korea there is a ferry to Fukuoka on Kyushu island (Japan). Cebu Pacific also fly from Osaka to Manila for the return. The flight from Dumaguete boarded on time. There was a scramble to find enough space for the cabin luggage as everyone seemed to be taking big boxes of cakes home with them from the little French bakery in the Dumaguete mall. Once we were all seated the pilot informed us that there would be an hour delay in take-off due to a backlog of flights into Manila. Luckily there was plenty of time between our two flights and no need to change terminals in Manila. Then the flight out of Manila was delayed for almost an hour waiting for a late connecting flight. We were glad we had booked a van to pick us up at Taipei airport which was a lonely place at 2am. The bikes arrived safely, packed in their new soft bags, although a little bashed around. We had booked three nights in the 'Dandy Hotel' which is number 1 on Trip Adviser. It was very good, although a bit far away from the centre of the city. We spent a day exploring the city and the second day putting the bikes together and buying last minute things from a pretty good bike shop just down the road. The best thing about Taipei is it's efficient transport system. The MRT is easy to use, with a ticketing system very similar to London underground. All the stations are announced in English as well as Mandarin. The buses are well labelled and all destinations are in two languages. There is a constantly expanding cycle path network. Most of the rivers have paths on both banks and it is easy to go from the suburbs into the city along these. We wandered round the Peace Park, watching the children feeding the birds, did a couple of museums and temples and spent an hour watching, but not comprehending, the puppet theatre. The following day would be the start of our Taiwan East Coast ride which would take in the whole of the east coast from the northern most tip to the southern most. We have been back in the UK for since the beginning of March and about to head back out to the Philippines at the end of June. If you look under "Tours" you will see them listed by country. So all of the old posts, apart from the last two have been cleared out of our blog. Have a look at our web site and let us know your comments. We had arrived on Cebu the main island of the Visayas, but we would also visit the smaller islands of Malapascua to dive with the glorious thresher sharks and visit the tiny Camotes islands. From Cebu the ferry would take us to our favourite Bohol island to visit the Chocolate Hills see the amazing Tarsiers and onwards to the island of Camiguin which strictly speaking lies within Minanao rather than the Visayas. After a total of seven weeks touring a final ferry took us back to Negros island and the sanctuary of Atmosphere Resort again. We flew from Ho Chi Minh via Manila to Dumaguete on Negros in the Philippines. For the next three weeks we stayed with oldest son Simon, and his wife Emma at our holiday apartment at Atmosphere Resort. The resort sponsors a soup kitchen in a nearby village. On the last day of term the children had a surprise visit from Santa and a special Christmas dinner. Emma cooked us a wonderful Christmas dinner. New Year's eve continued in a similar vein with a lot of drinking and making merry. Everyone wanted to sample Bigs' shots. Before we knew it it was time to be off again. We had planned a trip around the central Philippine group of Islands referred to as the Visaya Islands or Visayas for short. The main islands forming the group are Cebu, Negros, Panay, Masbate, Bohol and Leyte, although sadly we never got to Leyte, along with a number of smaller islands. The first stage of our ride would take us around the south and west of Negros. Following a short ferry ride we would then cycle around the south and west of Panay Island before ending for a rest in the famed holiday island of Boracay. After a few days rest in Borocay the next stage took us to some of the smaller and more remote islands of Tablas, Sibuyan, Romblon and Masbate, considered by some to be the "wild west" of the Visayas.